We are working to support and grow the numbers of of geoscience majors successfully transferring from two-year to four-year institutions within the San Francisco Bay Area. We are currently focusing on developing a network of 2YC geoscience faculty and building partnerships between our institutions. The primary goal for this network is to co-organize field trips and other social and professional development opportunities for our students, thus building a sense of community and science identity among 2YC geoscience students at our institutions. Some of the professional development events for our students will take place at four-year institutions, enabling 2YC geoscience students to network with their peers and potential mentors at those institutions. A secondary goal of the network is to facilitate the sharing of information that is beneficial to all of our majors with our faculty colleagues. In Northern California we have had a two-fold emphasis in the SAGE project. Through increasing collaborative opportunities amongst 2-year college geoscience faculty we are discussing successful instructional techniques and facilitating transfer opportunities for Earth science majors to 4-year institutions. We had our first workshop in October of 2016 entitled Improving Instruction and Supporting Transfer Opportunities in the Geosciences in the San Francisco Bay Area. Several faculty from 2-year colleges from San Francisco to Monterey participated in the workshop. Joining us from our two most important 4-year transfer institutions was the Chair of Earth and Climate Sciences at San Francisco State University and the Undergraduate Faculty Advisor from San Jose State University. This workshop was followed by two successful meetings that included programs for students from local 2-year colleges primarily De Anza College which is the home of the project. The first of these events was held in the Spring of 2017 entitled: Exploring the Geoscience Landscape 2017 Opportunities for Undergraduate Education in the Geosciences. Hosted by San Jose State University's Geology Department, students were exposed to presentations that ranged from career opportunities in the geosciences, to what it takes to major in the geosciences after transfer, and included a discussion of the various major in the geosciences at San Jose State. This was followed by a presentation of cutting-edge geologic research of the ocean floor being conducted by one of the newer members of the faculty. Students from San Jose State many who had been transfers into the program mixed with 2-year college students for informal discussions. This theme of building pathways was continued at our Fall 2017 workshop, Exploring the Geoscience Landscape 2018 Opportunities for Undergraduate Education in the Geosciences. The workshop included dialogue between multiple faculty from 2-year colleges with a number of faculty from San Francisco State University. Part of the discussion involved better meshing lower division requirements at the university with the California ASt degree being offered by local 2-year colleges. This session was followed by a session that was open to students from local 2-year colleges. Nearly 20 attended and listened to presentations ranging from opportunities in the geosciences to major at San Francisco State and other universities. It was followed by faculty research being briefly presented. The highlight was undergraduate and early graduate students presenting their research to the students. We are considering a field workshop mixing faculty and students from local colleges for the Spring event. At our home institution De Anza College we are working on developing curriculum for a Geology ASt degree to prepare students for transfer while constantly focusing on improving our instruction across the Earth sciences. This includes a focus on both active learning techniques in our classes and an emphasis on collaborative learning approaches. The Meteorology Department combines multiple active learning approaches in each of their on-campus classes and collaborative discussions and active learning models adapted to their online offerings. In the Geology Department discovery-based learning models with an emphasis in active learning and collaboration are being tested and improved. A highlight of this effort has been the ongoing work in several of the classes in both Geology and Meteorology integrating more collaborative testing. Over a three-year period with these models in place we have seen a rise in success rates of student populations on campus that have historically struggled with success across the college curriculum. [The Northern California Change Agent team is building on past successes and moving forward supporting our three goals of the SAGE 2YC project. These goals include: 1) Supporting the Success of all students in our geoscience classes; 2) Broadening participation of underrepresented groups in the geosciences; and 3) Facilitating professional pathways in the geosciences. Our continuing efforts are building bridges between local transfer universities and 2YC institutions facilitating transfer opportunities for our students. 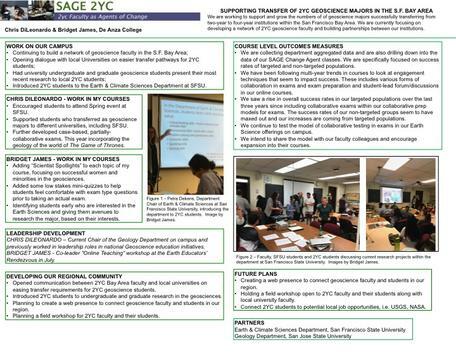 Additionally we are promoting best practices in undergraduate geoscience instruction and building a network of 2YC geoscience faculty fostering future collaboration in the San Francisco Bay region. Working with our colleagues within the San Francisco Bay region we are infusing best practices in geoscience education in introductory courses. Areas of specific focus include improving our evolving models of collaborative testing in introductory courses. Our developing model at De Anza College has seen substantial gains in success rates especially within our historically underrepresented populations in STEM. We are also testing low-stakes, high reward mini quizzes in some online course offerings that give students a first look at questions they will see later on exams. In the online environment we are also continuing to improve our earth science discussion forums. These and other practices are being used to help our students succeed in introductory geoscience courses. To offer these students opportunities to explore professional pathways and career opportunities we have been holding Fall and Spring "events." These Exploring the Geosciences Landscape"have been popular with students and also allow for networking with other 2YC and university faculty. In addition to the workshops we are promoting pathways in our classes both in person and online. In process is a new guided pathway document to be on the De Anza College websites for our department and division. Along with these changes are online courses are moving soon to include "Scientist Spotlights" which show the diversity of opportunities and cultural, ethnic, and gender diversity of the geosciences profession. Chris has long been involved in the development and inclusion of technology, data, and discovery-based learning in introductory earth science education, including NSF-sponsored projects to support data visualization in undergraduate education and gathering resources for the National Science Digital Library and the Digital Library for Earth System Education (DLESE). Chris was a founding member of the DLESE Steering Committee, serving five years including one as the Chair. After teaching for many years, Chris went back for a second graduate degree and completed a PhD. in 2001 at UCSC. He conducts research in fault system dynamics and the development of tectonic features in accretionary forearcs. 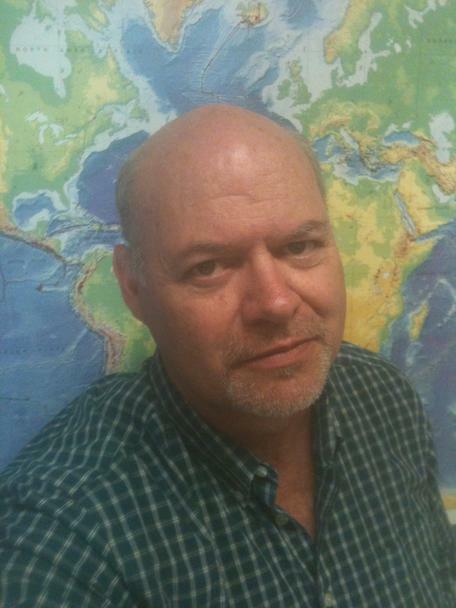 Chris teaches Physical Geology and Ocean Science. Bridget teaches Meteorology at De Anza College. She's also a Senior Lecturer for the Earth & Climate Sciences Department at San Francisco State University, where she teaches upper- and lower-division general education geology courses. She has worked as a GIS specialist, a structural geologist, and a hydrogeologist in both the public and private sector. Bridget is developing a textbook in Natural Hazards as well as co-authoring (with Chris DiLeonardo) an Oceanography and a Physical Geology text. 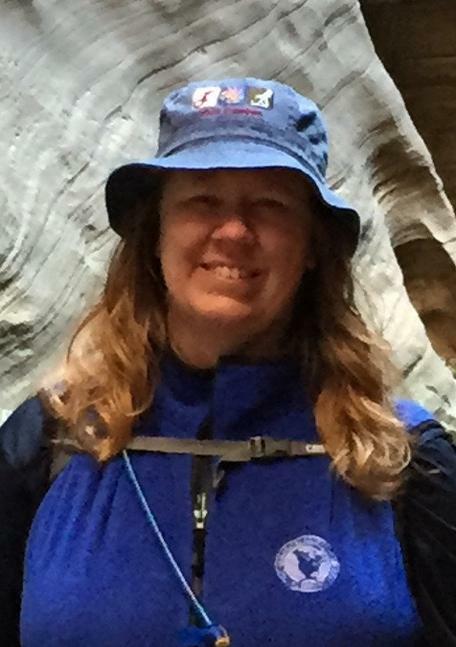 Bridget teaches Physical Geology, Ocean Science, and Meteorology. Institution: De Anza College is located in Cupertino, California, west of San Jose. It has about 23,000 students at one time, although serves more than 35,000 in a given year. Twenty-six percent of students are Hispanic/Latino, 34% are Asian and 9% are non-US residents. Five percent of their students are registered as having a disability. Geoscience program: The Earth and Space Sciences program at De Anza includes the Astronomy, Meteorology and Geology departments and is, along with Chemistry, Physics, Math and Engineering, part of the Division of Physical Sciences, Mathematics, and Engineering. Oceanography is taught within the Geology Department. There are two full-time and one part time geologists on the faculty, as well as one 1/2-time and one adjunct faculty in meteorology. More information is available from the De Anza College Geology program. Courses offered in the program include Physical Geology, Ocean Science, and Meteorology. Environmental Science is offered in a separate program at the Kirsch Center for Environmental Studies. Students are primarily taking geoscience classes for general education requirements; however, the classes also are gateways for majors in the Earth, environmental, and other sciences.